I just love my kids. What a good ending to a good day. For our May field trip we attended the Loma Linda University Medical Centers Children's Health Fair. It was lots of fun. There was so much to see and do. Here are a FEW of the things we did there. We will definitely be doing this again next year. We brought our dolls to have their checkups done. They were weighed and measured. We checked their temperature and blood pressure. They were given their immunizations. We checked their eyes and ears. We had our fingers cast. We also listened to the bodies heart beat. Our Little one is almost crawling, and I am very excited. I'm hoping that she will be walking before her little sister gets here. I got a new (pink) camera for Mother's Day and I've been having lots of fun with it. Happy Birthday Greg, the kids have been talking about your birthday all day. I hope you had a great day and got to do something fun. I have your gift and was going to take it to the post office then realized I didn't have your address, so I will just let mom and meli take it up to you. Hope you don't mind, plus it means I don't have wrap it (airline rules). This is my fav pic of you but it is from 2005. I think I need some updated pics, what do you think? Here is the ice cream recipe. It is from "The Ultimate Book of Kid Concoctions". Ann, one of our super cool moms at school did this for her parent project. 2 Tbs. sugar, 1 cup milk or half and half, 1/2 tsp vanilla, 6 Tbs. 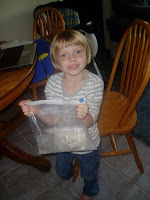 rock salt, 1 pint-sized zip bag, 1 gallon-sized zip bag, ice. 1. Fill the gallon zip bag half with ice and add rock salt. 2. Pour sugar, milk/half and half, and vanilla into pint zip bag and seal. 3. Place pint bag into the gallon bag and seal. 4. Shake the bag for 5-7 minutes. 5. Open small bag and enjoy. It really only took 5 minutes. Sometimes it's just easier with straw.